Posh striker Souleymane Coulibaly celebrates his first Posh goal at Barnet. Photo: Joe Dent?theposh.com. 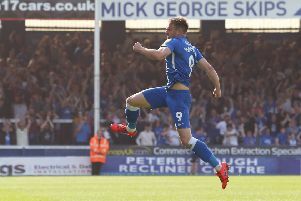 Crowd pleaser Souleymane Coulibaly scored his first Peterborough United goal at Barnet tonight (July 21) and promptly celebrated like Louis Smith. Back-flips will accompany every Coulibaly goal in a Posh shirt - at least until health & safety concerns kick in - and the centre-forward appeared to enjoy displaying his gymnastic ability as much as he did his scoring prowess. Souleymane Coulibaly executes his trademark back-flip after scoring for Posh at Barnet. Photo: Joe Dent/theposh.com. Coulibaly ran on to a Vassell flick five minutes into the second half and showed admirable control and composure to find the corner of the Barnet net with a firm left-foot drive. Posh ensured they would remain unbeaten this summer in the 66th minute when Harry Anderson continued his fine pre-season form to make it 2-0 after latching onto a Jermaine Anderson through ball to beat the home ‘keeper at the second attempt. Barnet responded with a last-gasp goal from Michael Gash, but the newly-promoted League Two side can count themselves unlucky to lose after dominating the first-half. Posh left behind full-back Kgosi Ntlhe and wingers Marcus Maddison and Jon Taylor, while midfielders Jack Collison and Harry Beautyman were absent because of fitness concerns. First-team captain Michael Bostwick and strike partners Joe Gormley and Conor Washington were left on the substitutes’ bench alongside another member of the enormous, and anonymous, Trialist clan. Vassell tested the Barnet ‘keeper early on, but Posh were soon on the back foot as Barnet employed a high-pressing. high-tempo style with a strong reliance of set-pieces, particularly long throws. But young Posh ‘keeper Dion-Curtis Henry was in agile form, particularly when saving well with his legs to thwart veteran Kevin Lisbie and later on when he made a smart stop at his near post to deny Mauro Vilhete. Lisbie struck the top of the crossbar just before the break and Henry was again called into action to save from John Akinde in between the two Posh goals. Overall it was a solid Posh display in a physical contest. Formee Posh striker Shaun Batt came on as a second-half substitute for Barnet. All four of the recent Posh signings played in the game with striker Lee Angol arriving for the final 30 minutes in place of Coulibaly. It’s now four wins and a draw from five summer outings for Posh. They’ve also scored 17 goals. Posh are next in action against Championship side Ipswich Town at the ABAX Stadium on Saturday (July 25, 3pm kick off). The London Road terrace will be closed for this game. Posh: Henry, Fox, Brisley, Zakuani (sub Almeida Santos 46 mins), Adebayo-Rowling, Newell, J.Anderson, H.Anderson, Sadlier, Vassell (sub Oztumer 60 mins), Coulibaly (sub Angol 60min). Unused subs: Bostwick, Maslen-Jones, Gormley, Alnwick, Washington, Da Silva Lopes, Trialist Z.
Jones, Hoye, Johnson (sub Muggleton 75 mins), Dembele, Nelson (sub N’Gala 67 mins), Yiadom (sub Tomlinson 68 mins), Weston (sub Champion 72 mins), Akinde (sub Gash 63 mins), Lisbie (sub Batt 46 mins), Vilhete (sub Gambin 69 mins), Togwell.